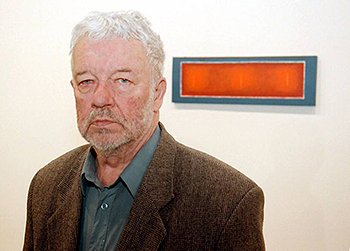 It’s been a long time since we published a text by Prof. Jerzy Nowosielski, even though popularizing his thought is among the goals we set for the blog. The reason we post a fragment of the Professor’s conversations with Zbigniew Podgórzec today is the “discovery” of ancient frescoes in Roman catacombs, which provided the media with material for speculation about the role of women in the early church. 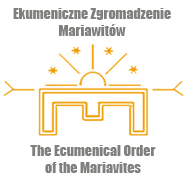 Although we both are strong supporters of full participation of women in all church ministries (unlike Jerzy Nowosielski, by the way, who believed the ordination of women to be an “ecclesiological nonsense”), we admit that we don’t feel very well in the atmosphere of sensation being created around these “discoveries.” In our opinion the interpretation of the catacomb frescoes the Professor put forward in 1982 explains their meaning better than what the media has been suggesting the last few days, which resembles more Dan Brown’s fiction than a serious approach to early Christian art and its content. Therefore we decided to translate it into Polish. Let’s take for example the catacomb frescoes depicting the scene we call Eucharist. One of them represents the scene of the Eucharist in the following manner: we see the table of oblation (prothesis) and the gifts lying on it. A man in a tunic is standing at the table and performing certain actions on the gifts, that is physically preparing them. Behind him is standing a women wearing a paenula, that is chasuble, with her hands raised, so as the orans. This is the scene we call Eucharist. It is the prototype of the actions performed during the Eucharistic Elevation or Anaphora from the Byzantine liturgy. In the Eucharistic canon of that liturgy the priest or the bishop, if he celebrates, says before the epiclesis: “We offer to You these gifts from Your own gifts in all and for all.” These words directly precede the choral singing of the Eucharistic hymn. The scene is so thought out that the Eucharistic Elevation itself, that is the action on the gifts, is performed by the deacon standing at the altar. In his left hand he holds the paten, in his right hand the chalice, and, rising them over the altar, he crosses them over his head. 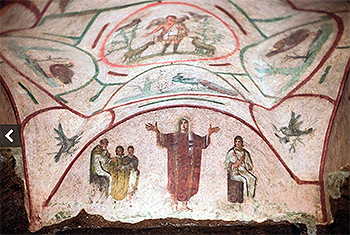 And behind him – precisely like in the catacomb fresco, the woman with raised hands as an orans behind the man wearing a tunic – stands the elder or the bishop with their hands likewise raised and loudly proclaiming the words “We offer to you these gifts…” Then the faithful sing the Eucharistic hymn. In the Eastern Church the Eucharistic chanting is the Eucharistic prayer sensu proprio. In this way the appropriate Eucharistic texts are proclaimed by the gathering of the faithful, represented by the figure wearing a chasuble, the elder or the bishop. If the latter, he not only wears a chasuble or a dalmatic, but also an omophorion. And as we know, the omophorion is nothing else but a women’s scarf. The scarf the Mother of God wore. In Western Christianity it symbolized the coat of St. Peter, while in the East the bishop wears it because it was the cloak of the Mother of God, and the Mother of God in her turn is a figure of the church. She has actually been one only from a certain moment on, for originally, in the first centuries, it was the figure depicted with her hands raised, the orans, the ecclesia. Only when the cult of Mary in its own right was introduced, that is following the Council of Ephesus, Mary Theotokos begun replacing the figure of the orans. So today it is believed that the Mother of God is the Mother of the Church and as such its figure. This is also the reason why Orthodox bishops wear a cross and a medallion with the Mother of God, and on less festive occasions only the medallion. I think that if the Eucharistic gathering after all the evolution of the understanding of the priesthood of all faithful, the presiding at the Eucharist, that is sacramental priesthood, returned to its original meaning, all issues concerning the ordination of women would collapse, because they are simply an ecclesiological nonsense. The woman raising her hands and singing the Eucharistic hymn, that is the hymn of thanksgiving, is actually the central figure of the church in prayer. Those who stand at the altar are only servants, or if it’s a bishop, he only presides at the gathering, but the thanksgiving, thus the Eucharist as such, is performed by the whole gathering. When the form of the Eucharistic gathering matures, it will invalidate all grudges or arguments about the sense of inferiority which women in the church now have. The reason why the whole gathering and the church in general has begun to be depicted as a woman with her hands raised will remain a mystery of early Christian mysticism and the consciousness of the faithful of the early church. And the identification of the church with a woman happens quite often. In the Shepherd of Hermas, for example, the church is also a woman. The woman appearing three times before him, first as very old, then as young with gray hair, finally completely young – is nothing else but a figure of the church. A panoramic view of the chapel designed by Jerzy Nowosielski in Kanonicza Street in Kraków. It’s atmosphere is supposed to resemble the catacombs. This entry was posted in English entries and tagged Nowosielski, theology, women, Worship. Bookmark the permalink.